Cracked. Wheat. Porridge. Nothing about that sounds good to me. Cracked wheat porridge with vegetables. Melt in your mouth potatoes. Sweet peas and carrots. And spices. And creamy yogurt. Served piping hot. It starts to sound better, no? Cracked wheat is made by cracking whole raw wheat berries. This means that it’s high in fiber and a whole host of other nutrients in addition to having a mild, nutty and comforting flavor. 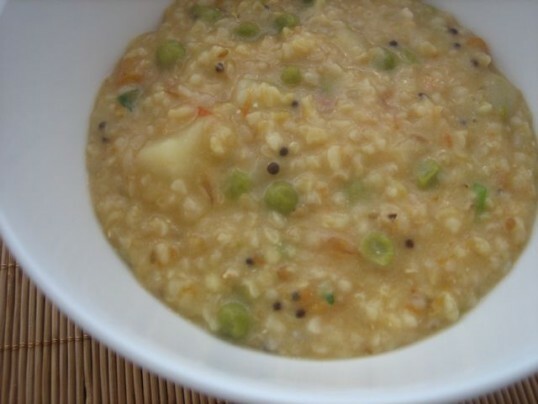 Dalia is a common Indian breakfast dish of cracked wheat usually made with peas, carrots and potatoes. Its healthy, savoury and hearty. Mixed in with a cup of low fat yogurt it even becomes creamy. What’s better than something wickedly healthy sounding that packs loads of good taste (yes, I said wicked…I know, since when did I become Canadian? This cracked wheat just has me that excited.)? This recipe is based on directions that Rajat’s mom gave me. His family makes this fairly often for brunch, which is where I was first introduced to it. My dad’s method was pretty similar except that he adds a bit of grated ginger and a dab of Olivio. I decided against the ginger to preserve the mild, nutty taste of the cracked wheat. In a deep skillet or saucepan, heat about a teaspoon of cooking oil on medium heat. Add the mustard seeds and cook until they sputter and pop. Add the cumin seeds and fry for a minute. Stir in the onions and green chilis and cook until browned and translucent – about 3-4 minutes. Add the tomatoes and cook for 2-3 minutes until melted. Add the peas, potatoes and carrots and cook for another few 2-3 minutes. Since you’re going to pressure cook the veggies, there’s no need to fully cook them right now. In a pressure cooker, pour about one teaspoon of oil into the bottom of the pressure cooker. Add the cracked wheat and about 6 cups of water. Stir in the vegetable mixture. Add about 2-3 teaspoons of salt. You can add more as needed after it’s pressure cooked to taste. I cooked this for ten minutes (measured from the time pressure is built up) in my Fagor pressure cooker. If your cooker whistles, I would guess that this is a one whistle dish. If the wheat still tastes a little hard after you open the cooker, just boil it on medium low for a few more minutes (stir to make sure the bottom doesn’t stick). 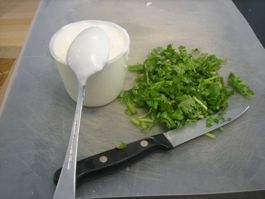 After pressure cooking, stir in the yogurt and cilantro. Adjust water as needed depending on how thick you want the porridge to be – I like it to be a little more on the liquidy side. Serve hot. 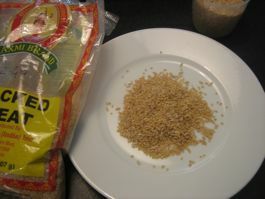 If you don’t have a pressure cooker, you can boil the cracked wheat in a separate sauce pan with about 4 cups of water (about 2 cups of water per 1 cup of cracked wheat) for about 15 until the wheat is soft. After you add the peas, potatoes and carrots to the saucepan, add 2 cups of water to the saucepan and bring to a boil. Boil until the potatoes are soft. Add salt. Then stir the wheat into the vegetable mixture. Adjust the amount of water to desired consistency. I think dalia seems like it would taste great with couscous or corn grits as well. If you give either of those a try, let me know how it turns out. Rajat wasn’t up for the adventure this time around, but next time around I think I’ll give it a shot. Thanks for the idea. I think I’ll make this. I have a packet of cracked wheat which I have not been using much since I can’t think of a lot of ways to put it to good use. I just keep making upma and dosas with it. ND: Thanks Rekha! Let me know how it turns out if you make it. Upma with cracked wheat is a great idea…going to have to try that. First time here, do various things with cracked wheat like upma, kesari, kheer, idli etc, but never tried with yogurt. Good idea, nice recipe. ND: Thanks for visiting and for the comment. Looking forward to checking out a2z. This looks so interesting! I never would have thought to put cracked wheat in a savory style dish but it sounds delicious. ND: Let me know if you try it out! That’s funny b/c I’ve never made it in a sweet, non-savory dish…will have to give that a try too. ND: Lol. Can I tell you how confusing it was to see your comment pop up in my inbox given that we share the same name 🙂 Thanks for stopping by! Inspired by your recipe, I made my own verison. It was really good. Thanks for the recipe. ND: Nice! Thanks for letting me know. Would love to hear what you changes you made so we can try them out. Nice, light and healthy dish. Really cracked wheat can taste good.